Bella Vivace sits at the end of a quiet country lane on 5 private acres of lush gardens and semi-tropical landscape with spectacular views of rolling mountains, coffee plantations and Pacific Ocean's Bay of Nicoya. This immaculate single-story, 800 sq' custom-designed apartment is fully furnished and includes outdoor patio, living room, full kitchen with dining bar, ground floor queen bedroom, full bathroom, laundry and private parking. This beautiful apartment is part of Hacienda Vivace, a spectacular, newly completed contemporary Spanish main home. The separate apartment is fully furnished and all utilities, internet and private parking are included. Breakfast is offered upon request at an additional cost. Hacienda's Bella Vivace is located on the outskirts of San Ramon in the quaint, high-end area of Magallanes, a mix of Costa Rican and expat residents. The area is quiet, safe and private, yet 5 minutes to downtown San Ramon. The entire Hacienda is a working coffee plantation with dramatic white coffee flowers in May and cherry red coffee berries in November through January. The Hacienda gardens are tended with care by the owners and provide an ambiance of beauty and tranquility. San Ramon is a 'muy tranquilo' provincial town of 20,000 that welcomes travelers with a graceful sense of pride and slow pace of life. The town offers it all -- from outdoor markets, supermarkets and shops, to restaurants and bars, 3-cinema theater, museums and art studios, a major hospital, and the University of Costa Rica. Bella Vivace is within minutes of most tourist attractions: from the volcanoes Poas and Arenal to Manuel Antonio Biological Reserve on the Pacific, pristine swimming beaches, sailing day trips, canopy tours, sugar cane and coffee plantation tours, horseback riding, or hiking and bird-watching in the National Parks. Andy and Nancy are a retired married couple from Santa Cruz, California. Andy is a former cabinet designer and Nancy a former Silicon Valley marketing executive. We designed and built the spectacular 5,000 square foot, contemporary Spanish Hacienda Vivace and 1800 square foot Casita over the past 3 years. Our architect fondly refers to it as "Andy and Nancy's art project". We are active members of the Community Action Alliance (CAA), a non-profit organization of expats and Ticos in greater San Ramón volunteering together for community development and enrichment. We do community outreach projects and fundraising for organizations such as San Ramon scouts/girl guides, local orphanage, children's cancer foundation, local music school instrument donation program, and more. We also host events such as Oktoberfest, Christmas Madrigal, and St. Patrick's Day. After looking at Bali, Thailand, Philippines, Mexico and Panama, we felt that Costa Rica had so much more to offer us. The country is incredibly beautiful, travel is easy, and the people are wonderful. There are many micro climates to suit individual needs and an abundance of things to do. In 1949 the country abolished their army and invested all their money into education and health care and, today, have a well educated, healthy and happy population. Recent surveys show that Costa Ricans are one of the happiest people in the world. Costa Rica has a very low crime rate compared to other countries in Central and South America. They also have a longer life expectancy because of the lifestyle they live - Pura Vida! The Pacific Highlands where we live is the heartland of Costa Rica with truly awe-inspiring coastal and mountain views, stunning sunsets, year-around weather in the seventies, historic culture, and wonderfully warm people. And San Ramón is the ideal central location for us to easily go to the airport, beaches, volcanoes, rainforests, and hot springs as well as cultural attractions like San Jose's Little Theater Group and the infamous Teatro Nacional. Hacienda Vivace will give you the chance to experience the real Costa Rica and ‘Pura Vida’ lifestyle, while enjoying the modern luxuries of a beautiful North American style home. We're located at the end of a private country lane on a working plantation that overlooks the Bay of Nicoya. You can bask in the early morning sunshine with your coffee on the back patio, contently sit and enjoy the view in the hanging basket chairs on the front porch, and enjoy evening cocktails and sunset on the upper balcony. Pick up fresh fruit and vegetables at the weekly outdoor market in historic San Ramon just 5 minutes away, drive to one of the local waterfalls and splash in the pools, visit an orchid garden or sugar cane factory, or launch a day of site seeing to volcanoes, the beaches, zoo, animal rescue center, one of many hot springs, canopy tour, or an evening at Teatro Nacional for symphony or ballet. Another unique benefit to staying at Hacienda Vivace is the food! We serve a hearty breakfast upon request, and If you are interested in experiencing local cuisine without leaving your patio, you can take advantage of the Hacienda’s private chef. Whether you are looking for typical Tico fare or a gourmet dinner, the Hacienda’s experienced chef comes highly recommended. San Ramon downtown is 5 min. drive. Located in village of Magallanes. 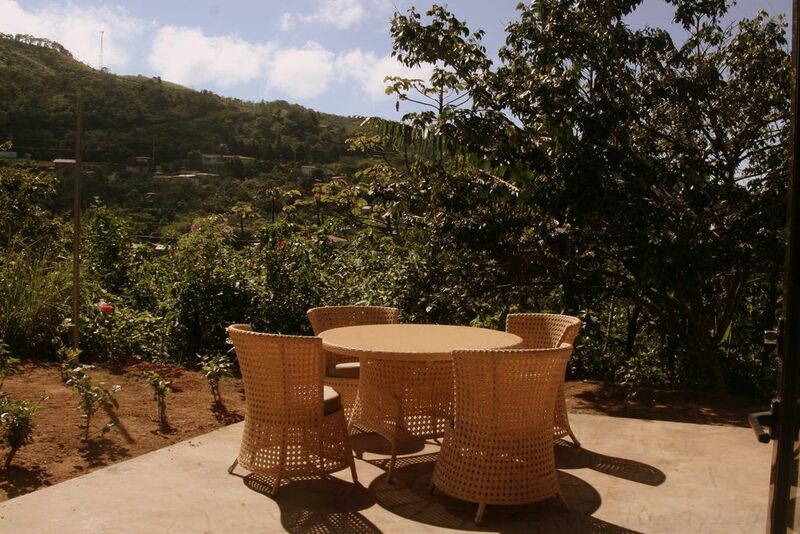 View of rolling volcanic mountains and coffee plantations. Tennis courts, Pickleball courts and Fitness Center 5 minutes from Hacienda. PERFECT DRIVING DISTANCE TO COSTA RICA SITES. The Hacienda is 45 minutes from the San Jose International Airport and central driving distance to the most memorable experiences of Costa Rica. Within 90 minutes are attractions such as Poas Volcano, La Paz Waterfalls and Gardens, La Fortuna hot springs, Lake Arenal, Carrera National Rainforest, Sarchi, Puntarenas, Zip-Lining, Butterfly Farms, Animal Rescue Centers, Manual Antonio Biological Reserve, and much more. The nearest beach is just a 30 minute drive away and part of a national rainforest, where capuchin monkeys come down from the trees to join you for lunch. We can help you with arrangements to ensure you experience the best of Costa Rica. QUAINT VILLAGE OF SAN RAMON. The Hacienda is 5 minutes by car from San Ramon, a 'muy tranquilo' provincial town of 20,000 that welcomes travelers with a graceful sense of pride and slow pace of life. Known as the City of Presidents and Poets, San Ramon has been home to four Presidents and many of the literary leaders of Costa Rica. The town itself offers it all -- from restaurants and cafes, to museums and art studios, a 3-cinema theater, supermarkets and shops, a major hospital and the University of Cost Rica. We offer a 15% discount on monthly rentals.